Ike Davis, who's had his (as sportswriters love to put it) struggles at the plate, hit a three run homer at Citizens Bank Park tonight to help the Mets complete a three game sweep of their division rivals and often nemeses the Phillies on their home ground. Having taken two of three from the Phils at Citi Field in April, the season record is now 5-1 Mets. The Amazins are now in third place in the Real Baseball League East, but a mere half game behind the division leading Nats and Braves. Third is as well as I'd hoped they would finish the season, even in my wildest dreams, but they're flirting with better. I can't help but wonder if I'm sharing the fate of Tantalus. Tonight's supermoon, or, as we here in Brooklyn Heights call it, Cosmo's moon, was obscured by clouds. 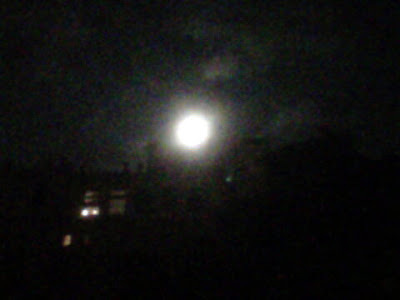 Last night, walking home from Jack the Horse Tavern, I did get this fuzzy photo (using my BlackBerry) of a 99% supermoon looming over Hicks Street.